November 12, 1962 –The Chicago Daily Tribune reports that a portion of Wacker Drive near Dearborn Street will become a “suspension bridge” [Chicago Daily Tribune, November 12, 1962]for a few weeks as a result of problems encountered during the construction of the new Dearborn Street bridge, problems that caused Wacker drive to sink seven inches. The drive was propped up with huge timbers while the bridge was being built, but with the superstructure of the bridge nearly complete, it is now time to return Wacker to its correct alignment on new permanent supports. A big problem presents itself, though – how to raise the street while foundation pilings are prepared. The innovative approach consists of stationing two cranes on the sidewalk east and west of the bridge, dropping cables from the cranes through holes in the roadway, and attaching them to huge I-beam “collars” around two sunken piers that support the road. The cranes will then lift the road up to the correct height while the bases of the damaged piers are excavated and new caissons prepared for each pier. The city’s bridge engineer, Stephen J. Michuda, says that the project should cost about $300,000. During the project the lower level of Wacker Drive will be closed to westbound traffic. The construction of the Dearborn Street bridge has caused big problems. The old bridge was removed in 1959, and the construction of the new bridge has been repeatedly delayed, principally because of problems in sinking caissons to support the structure. 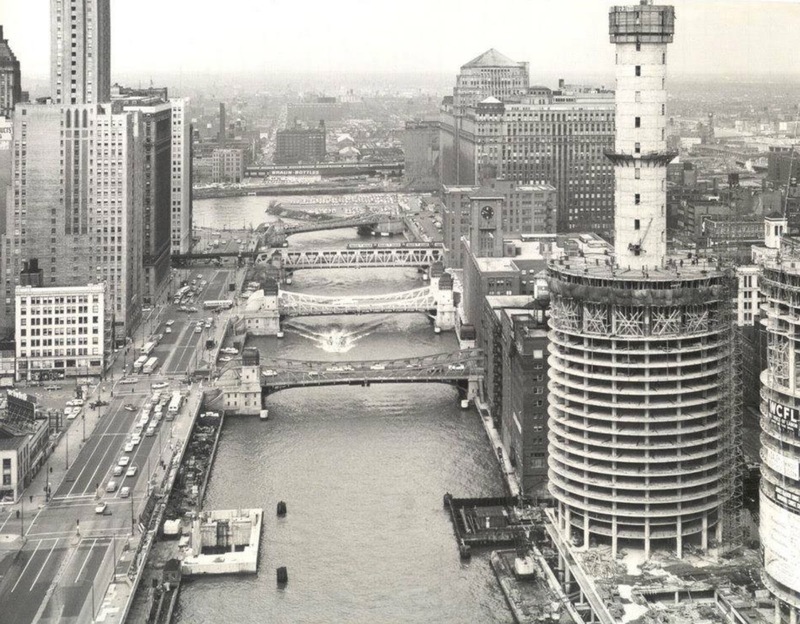 The above photo shows the foundation in work for the bridge on either side of the river in the foreground, adjacent to Marina City as it is midway through its rise. November 12, 1943 – Plans for the construction of a $2,000,000 bridge over the north branch of the Chicago River at Grand Avenue with a viaduct extending from Orleans to Des Plaines are submitted to the city council subcommittee on motor fuel tax. Oscar E. Hewitt, the Commissioner of Public Works, says that as part of the project a viaduct will span the Chicago, Milwaukee and St. Paul and Chicago and North Western railroad tracks with a roadway that is 56 feet wide, a plan that will relieve congestion on the approach to the present Grand Avenue bridge, which has a roadway width of only 19 feet. Hewitt concedes that construction will not begin until after the war is concluded. It was a good plan, but as is the case with many good plans, it never happened. The bridge, finished in 1913, still carries traffic and pedestrians across the river. Volume on the bridge was greatly diminished when the Ohio Street expressway feeder ramp and bascule bridge, a few blocks to the north, was completed n 1961. November 12, 1932 -- The president of the Chicago Historical Society, Charles B. Pike, dedicates the society’s new building in a ceremony that is “long on dignity but short on oratory.” [Chicago Tribune, November 13, 1932] Pike says, “We stand here today at the portals of a building expressive of its purpose, ready to open it to the public. We are looking through the trees of Lincoln park to the waters of Lake Michigan and St. Gauden’s statue of the Great Emancipator . . . Lincoln belongs to the ages. So also do Columbus and Washington. 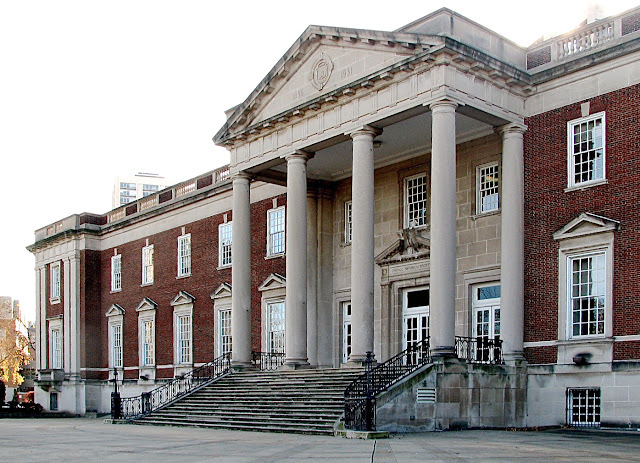 Housed in this building are relics of all of them, and many others who influenced the shaping of America’s destinies.” First in the door is Miss Rhea Zugenbuehler of Maywood who pays a quarter to enter. Anyone who shows up on Mondays, Wednesdays or Fridays will be admitted for free.